Frank Porcelli has made Salisbury home to American Waste Skateboards. Frank tells us his passion started when he was a teen, back then he saw his friends make their own boards which sparked his curiosity. "He made a press and he pressed a few boards and I went over to check it out and that got me interested in doing it," says Frank. After a few trials and errors he eventually figured out how to make his own. Frank tells us he likes to focus on the quality of the board to make sure they last. "My goal is to have them last for months," says Frank. 47 ABC got a behind the scenes look on how it is all done. Frank starts by layering and gluing 7 thin sheets of hard maple, and once they are all stacked up he places it into a mold. The mold squeezes the sheets tightly and it slowly starts to resemble the shape of a skateboard. 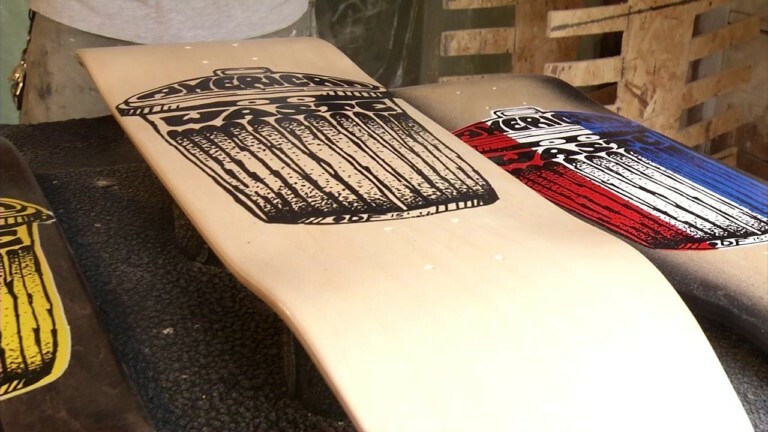 Once the board is all dried up Frank marks it into the shape and design he wants. The marks serve as a blueprint when he's ready to cut it out. He then takes the board to the sander to get a more precise cut, then he smoothes out the edges and drills out the screw holes. Frank then takes out his handmade silk screen and prints out his logo and clear coats it to finish it off. Another hand made skateboard ready to shred the streets of Delmarva.